Today’s post is from Juha Penttilä, one of the organisers of the Vegan Dharma Challenge. Initially I thought a decent pizza was one of the things I would simply have to live without when transitioning to a vegan diet. It was not a happy thought to be thinking. From a dharma perspective this is of great importance. It’s interesting to reflect on how attached we can become to certain basic sense experiences, to the point that we maybe willing to completely overlook any ethical problems connected to them as long as we get the desired experience. This kind of avoidance is not only related to issues of diet of course, but is a common dynamic in the ethical dilemmas of consumer society, whether we’re looking at climate change and air-travel, or the impact of our consumer habits on the ecological habitats and human communities through the industrial scale extraction of natural resources. There is a tension between satisfying our desires and the impacts of our actions on other beings. And it may be difficult to face this dynamic because of feelings of guilt. And that’s where the pizza comes in. After putting my suspicions aside I’ve learnt that it’s completely possible to make great pizza without using animal products. The key I’ve found is to use good ingredients and to use enough oil, salt and garlic (the taste buds don’t lie). 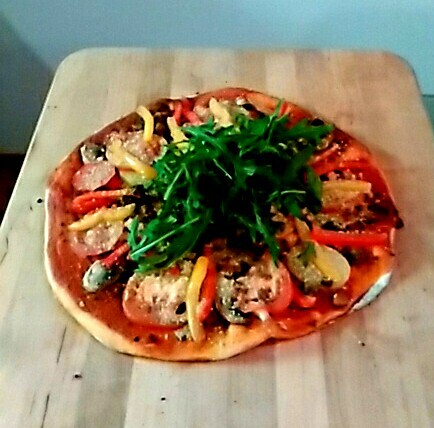 I didn’t really have a recipe when making the pizza in the picture, but when googling for recipes I found this recipe from the Minimalist Baker to be remarkably close to what I did. Enjoy!